Terms and Conditions and Website Disclaimer for www.happycampers.ie the website for Happy Campers. 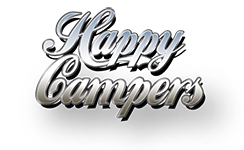 Happy Campers is a sole trader business owned by Brian Lacey t/a Happy Campers. Within this document www.happycampers.ie website will be referred to as “Site”. Any details you give us will be at your own discretion. We will not pass your details to a third party without your consent. Should you fill out the contact form, the information collected with be used to liaise with you in the future. While every effort has been made to ensure the accuracy of all material and information on this Site, Happy Campers makes no representation or warranty, express or implied, concerning material, content and information on this Site, which are provided “as is”. Happy Campers excludes all express or implied terms, conditions, warranties, representations or endorsements whatsoever in relation to the viewing, use or performance of this Site or any information provided through this Site. 1.This Site including all its contents has been prepared to the best of our knowledge and is subject to change. This Site is intended as a general guide to Happy Campers, our people, our practice areas and careers opportunities and does not give legal to any of its users. No liability can be taken for any omissions or errors. Happy Campers excludes all liability for any indirect or consequential loss, or for any direct or indirect loss of profit, data, opportunity or reputation, or any other incidental, punitive, special, exemplary loss or damage howsoever arising from the use of (or failure to use) or reliance on the Site. This limit does not apply to any liability we may have for death, personal injury or resulting from any negligent or fraudulent misrepresentation. The disclaimer in this section shall not operate to exclude any term, warranty or liability that may not be excluded under Irish law. This lists the conditions and regulates your use of the Happy Campers Site and its contents. Accessibility: The Site and the services provided on it are usually available 7 days a week and 24 hours a day. Due to technical or editorial work, availability might be interrupted on a short term basis. Happy Campers is neither responsible for the interruption of access mentioned above nor for the possible consequences such an interruption might have for users or any third party. Limitation of liability: Happy Campers is neither responsible for any damage or breakdown that may be caused by using the Site or downloading files. Furthermore, Happy Campers cannot be held responsible for any damage caused due to unauthorised interruption to the administrative system of the Site. Exclusion of responsibility for third party Sites: Happy Campers does not hold any responsibility for the content, materials, data or accuracy of third parties’ Sites that can be reached via hypertext links from this Site. Intellectual property: All contents, designs and formatting on this Site are protected by the laws on royalties and associated rights. By using the Site, users recognise these rights. Names of products, companies or organisations may appear on this Site. They remain the property of the respective party and are not to be copied, distributed, published or sold by the user without their prior agreement. Should you wish to discuss any matters or concerns relating to the processing of personal data on our Site or any aspect of the Site itself please contact us by email or post.